It has become almost universal in agreement that Jesus was born on December 25th. Children sing about this in their church Christmas plays. Secular media commentators reference this day as Jesus’ birth during the Christmas season. Even the “Jesus is the Reason for the Season” signs suggest this time of year is special because it celebrates the birth of Jesus. Certainly, there are some who don’t accept the 25th of December as the birth date of Jesus, I being one of those voices. But these voices are lost in the roar of the crowd who accept the 25th of December as His birth date. So why the almost universal acceptance of December 25th as Jesus’ birth date if, in fact, it is wrong? Christmas is a Pagan Holiday? This explanation of a pagan background has become the accepted reason for why December 25th became the date of the birth of Jesus. What is missing in the Christianity Today article, and most discussions about the origin of December 25th as the date for the birth of Jesus, is the possible Jewish cultural background to this date and future Christian practices. The Jewish cultural background I am referring to is the holiday of Chanukah. The Greek general, Alexander the Great, captured the known world in the late part of the 4th century B.C. Alexander would unite his kingdom in the Greek culture and language, the Hellenization of the world, which would have a big impact on Israel and the Jewish people. His reign was short-lived as Alexander died at the young age of 33, and his kingdom was then divided among his four leading generals in 313 B.C. Two of the resulting dynasties were known as the Ptolemaic, headquartered in Alexandria, Egypt, and Seleucid, headquartered in Antioch, Syria, empires. Israel was located between these rival kingdoms. On the 25th day of the month Kislev in 168 B.C. Antiochus IV, also know as Antiochus Epiphanes, head of the Seleucid dynasty, took over the Jewish Temple in Jerusalem. He set up a statue of Zeus in the Temple and sacrificed a pig on the bronze altar to Zeus. Many of the Jewish people of Israel had become Hellenized in their thinking and practices because of the 150 years of Greek rule. Although stunned by the actions of Antiochus they went along with his decrees believing this to be the best course of action. A small remnant of Jewish people refused to bend their wills to the dictates of this despotic ruler because of their faith in Jehovah. Shortly after Antiochus issued his decrees and defiled the Temple, a contingent of his army came to the small town of Modin, about 18 miles to the northwest of Jerusalem. An elderly priest by the name of Mattathias and his five sons, John, Simeon, Judah, Eleazar and Jonathan lived in this town. The captain of the troops ordered an altar built and the citizens of Modin to offer a pig as a sacrifice to Zeus. One apostate was very willing to make the sacrifice, but Mattathias and his sons were enraged at this unholy act and slew the apostate as well as the soldiers of Antiochus. They fled to the hills where they were joined by many Jewish believers in Jehovah and began a time of guerrilla warfare against the evil forces of Syria and their king, Antiochus Epiphanes. Shortly after fleeing to the hills, Mattathias died. He left his forces in the hands of his son Judah Maccabeus. After months of battles Judah led his forces into Jerusalem and recaptured the city and the Temple. They cleansed the defiled Temple, rededicated it back to Jehovah, and Judah declared that an eight day holiday should be instituted memorializing the restoration of the Temple. This was done on the 25th of Kislev, 165 B.C., exactly three years after the desecration. This holiday became known as the Feast of Dedication or Chanukah. The explanation for the length of the holiday is based on the legend that only one cruse of consecrated oil, a day’s worth, was found for the lighting of the menorah. Miraculously, this one cruse of oil burned for eight days providing time to consecrate more oil. And so today Jewish people celebrate this holiday for eight days around the lighting of candles in their menorah on each night. The holidays of Chanukah and Christmas have a number of common themes. There are three that I believe are pertinent to the question, Why December 25th? The first is the holidays fall on the same day – the 25th. Chanukah begins on the 25th of the Hebrew month Kislev and Christmas is celebrated on the 25th of December. The second common theme is that of light. For the 8 days of Chanukah candles are placed in the Chanukiah, the menorah, with one on the first day, two on the second day, until the eighth day when there are 8 lit. One of the customs of Christmas is the festive decoration of lights on houses and Christmas trees. The third common theme is the centrality of the servant in each holiday. The chanukiah has a ninth branch that is either set apart or elevated from the other 8 candles. This ninth branch is called the shamash candle. Shamash means servant and it is with this candle the other 8 candles are lit. Christmas celebrates God’s Servant, the Messiah Jesus, coming into this world. In 4 chapters of Isaiah – 42, 49, 50, 53 – the Messiah is called the servant. Chanukah remembers an event that occurred in the 400 years between the end of the book of Malachi and the birth of Jesus. It is not mentioned in the Old Testament at all, though Antiochus and what he would do is prophesied in Daniel 8. The only mention of Chanukah is in the gospel of John. “And it was at Jerusalem the feast of the dedication, and it was winter,” John 10:22. Chanukah means dedication. Jesus went to the “feast of Chanukah” when it was being celebrated in Jerusalem. We have no record of how Chanukah was celebrated during the days of Jesus. Just that it was celebrated. I think it is safe to presume that there were at least two components to the celebration. One would be the telling of the story of the events around this time period with the rededication of the Temple. The second part of the celebration almost certainly would have been focused on a menorah and the lighting of candles remembering the miracle of the one cruse of oil that lasted for 8 days in providing light for the Temple menorah. So, at least the mention of the shamash candle in Jewish sources is many centuries after the destruction of the Temple. This does not mean, though, that the appearance of the shamash candle didn’t come sooner than the 16th century. In fact, there is evidence that the shamash candle did appear on the scene many centuries earlier although it was not mentioned in Jewish writings. Why isn’t the nine branched chanukiah and its use in the Jewish world developed in more detail? The discovery of some ancient nine branch chanukiah in Israel raises more questions about the lack of Jewish historical development of the chanukiah. The first is reported on by Heritage Auctions. “The decorative motif and general form share similarities to the Beit Natif type, commonly dated to the Third Century CE or later. However it appears to be an early, transitional form, extending the dating to the period between the Jewish War (66-70 CE) and the Bar Kokhba Revolt (132-135 CE). The nine spouts are thought by at least one prominent expert to mark this lamp as an early form of ritual Hanukkah lamp, or Hanukkaiah, as directed in the Talmud to celebrate the Festival of Lights in honor of the Wars of the Maccabees, in which the people of Israel secured their religious freedom. Weiss reports on two other discoveries. With thousands of Jews coming to the Lord in the early church period, it is easy, and likely correct, to conjecture that towns in the Golan, like Sogana, could have become largely followers of Messiah Jesus. The discovery of early, 1st century, nine branch chanukiah and the lack of historical development of its origins by the Jewish community pose an interesting possibility. Was the shamash candle added by the Jewish followers of Yeshua in the first century in order to celebrate this holiday that Jesus celebrated, but, now, focusing the attention on the servant candle which gives light to the other candles. These Jewish followers of Jesus would have understood the darkness of sin that infected all people. They would have understood that Jesus, who proclaimed Himself as the light of the world, John 8:12, was the only One who could give the light of life to people. They certainly were aware of the four servant passages in Isaiah speaking of the Messiah who would bring redemption to Jew and Gentile. Were Jewish followers of Jesus the ones who introduced the nine branch chanukiah? The evidence indicates it is a distinct possibility. I think there is a better explanation of “Why December 25th?” The early church, 2nd century and following, animosity toward the Jewish people and their culture and customs is well established. The adoption of an anti-Jewish understanding became the norm in the first couple of centuries after the Jewish apostles and the first century church (a good part being Jewish believers) passed into history. The early church fathers followed the Julian calendar, introduced by Julius Caesar in 45 B.C.E. The article argues for the Julian Calendar as the church calendar. Why, though, the 25th of December? From the above information, we can piece together a possible explanation for the celebration of December 25th as the date for the birth of Jesus. 1. The 9 branch chanukiah was clearly used following the destruction of the Temple in 70 A.D., regardless of the Jewish communities lack of acknowledging this fact. 2. It is logical to believe that the Jewish believers in Jesus introduced the shamash candle and the 9 branch chanukiah in order to remember their Messiah after the destruction of the Temple. 3. If the shamash candle was a picture of Jesus bringing light to Jew and Gentile, it is understandable why the larger Jewish community would not want to be associated with the 9 branch chanukiah and the shamash candle. 4. 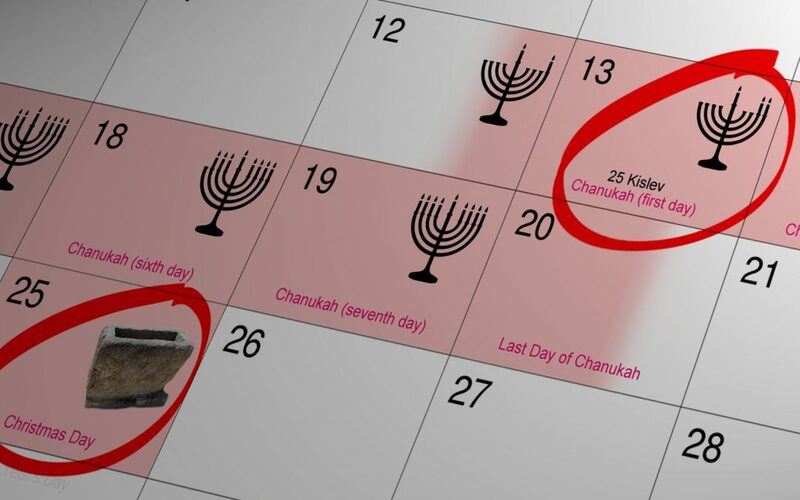 With the Jewish people scattered in the diaspora after 70 A.D., and the use of the Julian calendar in the Gentile world, it is very possible that the Jewish believers in Jesus, prohibited by the anti-Jewish church and culture to remember events on their Jewish dates, used the parallel day of 25 used in the Gentile world. This calendar day being in the month of December. Thus, the 25th day of December was chosen to remember the Shamash of God, Jesus, coming into the world to bring light to the world as the Jewish followers of Jesus tied in the events of Chanukah with Jesus as the Shamash of God on December 25th instead of Kislev 25. 5. If December 25th was in fact introduced by Jewish believers to remember the events of Chanukah and Jesus as the Shamash, it is understandable why the 3rd and 4th century church fathers, wanting to wipe every vestige of Jewishness from the church, came up with the explanation that December 25th was the “church’s identification of God’s son with the celestial sun.” This explanation was possibly offered in order to separate the Jewish believer’s celebration of Chanukah and Jesus as the Shamash on this day from the celebration of Jesus’ birth on this day throughout the (largely) Gentile church world. The church fathers rejected the Jewish calendar followed by Jesus, the Jewish apostles, and the first century church, comprised of primarily Jewish believers. Their rejection of the Jewish calendar and the adoption of the Julian calendar, wedded with their animosity toward all things “Jewish,” possibly resulted in the acceptance of December 25th as the birth date of Jesus as early as the late 3rd century. Certainly one can’t be dogmatic on “Why December 25th?” and the relation of that date to Chanukah and Christmas. What we can be dogmatic about is that Jesus was born into this world! He came into this world as God’s Servant! As His Servant He died for your sins so you can have the forgiveness of sin, a personal relationship with God, and a home awaiting you in heaven! Merry Christmas, as He was born into this world to die for us! Happy Chanukah because He is the Light of the World! 4. Alfred Edersheim, The Temple: lt’s Ministry and Services as they were at the time of Jesus Christ, p 334.